http://img12.imageshack.us/img12/3664/20...91280x.png urxvt, chromium. ignore the mess that is irssi. 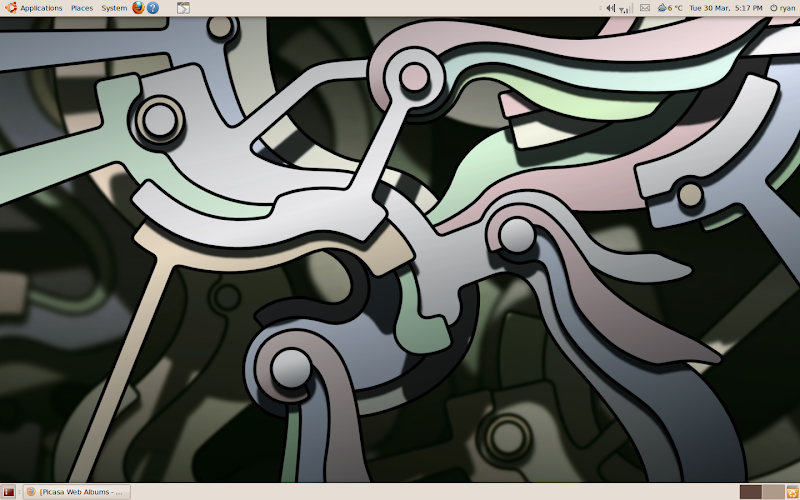 conky/tint2 configs are by me.. if anyone wants it, i'll post. "Awesome" window manager on Ubuntu. Really helps boost my fps in games. Here's mine. Tiling WM's rock my workflow..
post desktop not THAT thing. "all your signature are belong to us"
IMO, the whole point of desktop space is to have a lot of free space. 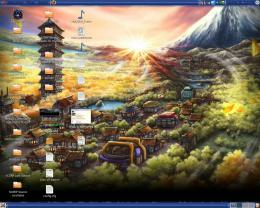 Besides, I love being able to show-desktop to look at my background. Well, Ill go ahead and do mine! My Ubuntu, Kubuntu and OpenSolaris are using the same background! Basically my background is a logo for a linux distro/desktop environment im in the early stages of designing lol. I guess thanks to the Dock, you also see my fave apps :p.
Check out my site: www.alisdairrankine.com! Browser to the left, some totally random code to the right. Tiled wallpaper which I don't usually see is in attachment. (03-31-2010, 03:59 AM)vaan Wrote: post desktop not THAT thing. The topic is "Post Your Desktop", not "Post Your Wallpaper". Usually, that means taking a screenshot of how your virtual computer desktop looks when you're doing something on it. Edit: Anyone interested can join the project and upload their screenshots, Qt themes, configs, panel backgrounds, etc. (03-31-2010, 03:51 AM)lda17h Wrote: Here's mine. Tiling WM's rock my workflow..
What IRC client are you using there, Ida17h? (03-31-2010, 03:27 AM)ImpulseNine Wrote: "Awesome" window manager on Ubuntu. Really helps boost my fps in games. Background is a ubuntu default. Bottom panel: show desktop, application switcher, workspace switcher, trash bin. Pattern for menu panels is Northern Lights by dinpattern (exceptional site, by the way). Nice! I like all the linux representation in here. It's definitely a fun OS to learn / play / _really_ understand computers on. I'm keeping it simple and clean. However, I'll install Arch with KDE soon. Now it's Ubuntu and Gnome. (06-21-2010, 04:17 PM)Exitium Wrote: I'm keeping it simple and clean.